Protecting yourself from fire dangers is crucial. 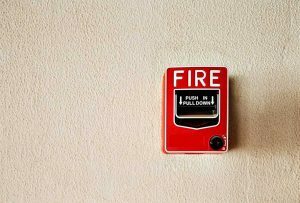 Fire safety is a top priority in many medical facilities. In fact, the truth is, there is no real room for error. As a result, medical facility management personnel need to be able to cultivate proper strategies which will achieve fire safety in their medical centers. Here are some solutions that are able to create fire safety measures in any type of medical facility. Most commercial fires are started in the kitchen. In fact, kitchen fires are caused by faulty cooking equipment or lack of oversight in kitchens. As a result, having a strategy to have more eyes in the kitchen is a great way to prevent these types of fires from occurring. Even the Federal Emergency Management Agency (FEMA) determined that the peak times of kitchen fires corresponded with meal preparation times. Therefore, emptying all appliances that are known to collect grease is a great way to prevent grease fires from occurring in a medical facility kitchen. It is very important that electrical outlets work properly and are unobstructed. In fact, cooking fires are typically confined to a single room or cooking appliance. On the other hand, electrical fires are not contained. They spread rapidly and very quickly. That is why it becomes so crucial to ensure that all medical facility outlets and wires are not overloaded and working properly. This is a very common sense strategy. However, it can go overlooked sometimes. In fact, it’s common knowledge that smoking near a medical center should not be allowed. This becomes even more critical near oxygen-dispensing machines. The reality is that smoke and oxygen do not mix. As a result, the easiest solution is to ban smoking in and around medical facilities to ensure that a fire does not break out due to a chemical reaction between smoke and oxygen. This entry was posted on Thursday, May 4th, 2017 at 1:47 pm. Both comments and pings are currently closed.